William Clark started Moose Hill Worm Farm in 2013 in anticipation of retiring from his career as an Air Traffic Controller in 2014. 2019 will be his 6th year as a vendor. William took over knife sharpening from another longtime vendor Pete Burkart late in 2017. William and his wife are both USAF veterans. He loves talking to people so the Williamsburg Farmers Market is a great place to combine business and pleasure. The vendors make a close community that benefits both the vendors and the customers. 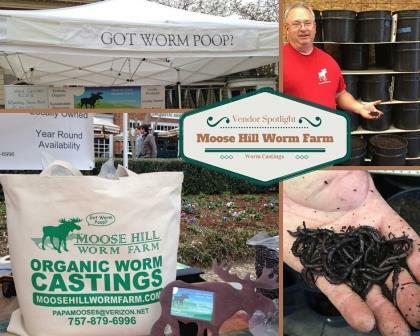 Moose Hill Worm Farm has been selling high quality organic worm castings in the Eastern Virginia area for more than five years. It is their goal to provide this excellent organic soil amendment all year long. They are a family owned and operated grower located in the Gloucester Courthouse area. They have a dedicated building that is heated and air conditioned so the worms are kept under optimum conditions to produce the finest high quality organic worm castings on a consistent basis. Worm castings can be used generously anywhere in pots or the garden. While the castings feed plants generously, over time the benefit of using worm castings to new plants is to help establish a much healthier root system which makes for a healthier plant. Moose Hill’s sharpening services include knives, scissors including sewing scissors, pinking shears, garden tools, mower blades and they are happy to look at anything else that might need sharpening. They’ve also done pizza wheels, machetes, mezzalunas, and axes.